Cockroaches are among the hardiest of all insect species, and they did not even exist in North America until 1625 when they were brought to the continent from their native Africa. However, the introduction of different cockroach species into North America has been occuring ever since then. In just the past decade, several new cockroach species have arrived in the United States from foreign regions. For example, the Periplaneta japonica species that is native to Japan was recently spotted in New York City for the first time ever. This species of cockroach is notable for being able to withstand relatively cold temperatures. The first ever finding of a Turkestan cockroach was recently documented in the southwest US. Now researchers believe that the Turkestan cockroach may also have invaded New York City. The rapid introduction of new cockroach species into the US can make it hard for experts to stay on top of the roach species that have come to call America home. Of the 4,500 cockroach species that have been documented, only 30 are categorized as pests. 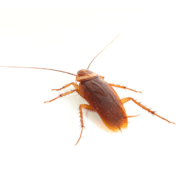 Of these 30 cockroach pests, four are particularly problematic within American homes. These four cockroach species are the German, American, Australian and Oriental cockroaches. While the German cockroach is the most abundant cockroach species in America, it is the American cockroach that people hate finding within their homes, as these cockroaches are large in size and fast on the ground. Australian cockroaches look similar to American cockroaches, but the Australian cockroach is smaller is size. The Australian cockroach is often reported as flying into people’s faces and hanging from ceilings. However, the oriental cockroach is considered the most significant from a public health perspective, as these cockroaches dwell within sewer systems where they collect numerous disease-causing pathogens on their body. Have you ever witnessed a cockroach emerging from a sewer?